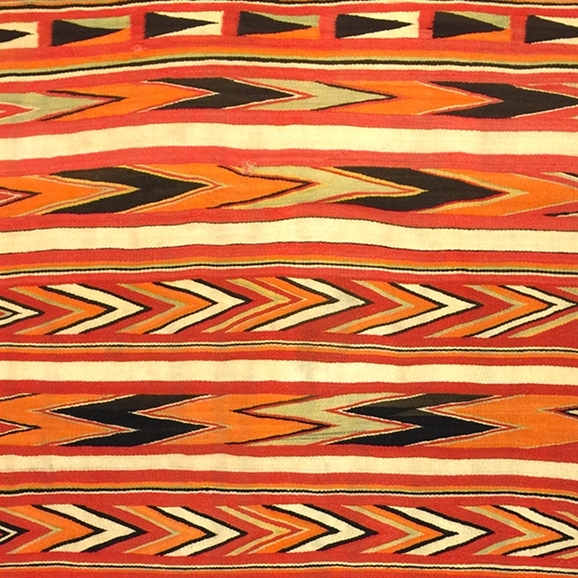 Transitional weavings, circa 1885-1910, represent an under appreciated class of Navajo textiles often overlooked as being made during a lesser time of Navajo weaving production. What has not been recognized until recently is the incredible artistic exploration that occurred during this time period forced by economic pressures on Navajo weavers to stop making blankets to wear and shift producing to making rugs for the floor. A TIME OF CHANGE explores this snippet in history which allowed weavers greater freedom to explore new artistic expression in compositions and colors never imagine. Over 30 unique examples of these transitional textiles will be on display and for sale through June 2018 at Tucson’s Mark Sublette Medicine Man Gallery. Show ends June 30, 2018. Navajo Chief's Blanket Variant, circa 1890s, 48" x 48"
Navajo Crystal Transitional Blanket, circa 1890s, 48.5" x 37.5"
Navajo Germantown Eyedazzler Weaving, circa 1890s, 37" x 26"
Navajo Third Phase Chief's Blanket, circa 1900-20s, 47" x 68"
Navajo Third Phase Chief's Blanket, circa 1900s, 43" x 53"
Navajo Transitional Blanket c. 1890, 83" x 54"
Navajo Transitional Blanket c. 1890, 85" x 58"
Navajo Transitional Blanket, circa 1890s, 49" x 40"